Ilford Imaging of Switzerland are insolvent and have closed their inkjet paper factory. 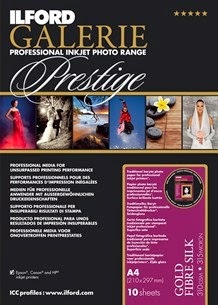 They are a separate company from Ilford UK, who make traditional film and darkroom supplies. That company is owned by Harman, who also produce Harman inkjet paper. Ilford Gold Fibre Silk was the staple paper for many of us. Its surface and warm hue were beautiful; furthermore, it was one of the cheapest fibre-based inkjet papers. There are still stocks available, so now is the time to ensure you buy as much as you'll need. All will not be lost, however, as there are other papers that are very similar. 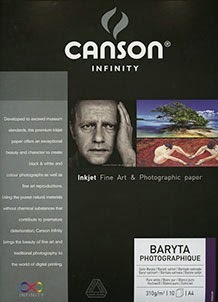 Canson Baryta Photographique is the most cited replacement paper for Gold Fibre Silk. Ernst Dinkla is a print studio owner from The Netherlands who has compared the Canson and Ilford. He thinks the differences are so negligible that they may be more a question of the individual batch, than the make. Another person who uses both, said in a forum that the difference was possibly only perceptual; Ernst said elsewhere that it may be hard to tell them apart on a blind test. Ernst's Lab measurements are below, quoted from Luminous Landscape Forum discussions (see below for the links). Measured: Canson Baryta Photographique Lab 98.0, 0.1, 0.0 and the Ilford Galerie Prestige Gold Fibre Lab 97.8, 0.0, -0.8. That 0.2 difference on the b is less than people see as a difference with two samples next to one another. The sample of Gold Fibre Silk that I measured before it got the prestigious name had a Lab 98.2, 0.0, 0.5 measurement. The differences are production batch differences in my opinion. The spectral plots are identical. ... The Bonjet Atelier Fibre, Canson Baryta Photographique, Ilford Galerie Prestige Gold Fibre Silk, MediaJet PhotoArt White Baryta and the Innova IFA69 FP Baryta Satin have identical spectral plots and the same 310 gsm weight. So it does not surprise me that the ICC profiles can be exchanged for them. July 2013, 500+ inkjet media white spectral plots. At B&H, the Canson currently works out cheaper than the Ilford in NZ (though metric sizes are mostly unavailable at B&H). Fotospeed claim that their Platinum Baryta is a direct replacement for Gold Fibre Silk, but no one seems to have tested that claim yet. PS: I have just received some Canson Baryta Photographique and, in a quick side by side comparison, could not tell the two papers apart. Canson's packaging is more robust than Ilford's and the paper is in a plastic bag inside the box, which my last boxes of Ilford lacked.